Nurse Ratched's Place: Damn You, Perez Hilton! OK, I’ll admit it, I’m jealous. 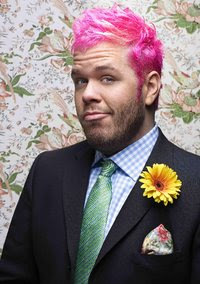 According to the Wall Street Journal, Mario Lavandeira, AKA Perez Hilton, is getting his own mini radio show, book deal and movie. Perez might even get his own record label. He started out his career as a blogger, and now he’s hanging out with celebrities, yakking on the airwaves, and charting a course to success. Of course, I could be doing those things, too, if I had 7 million visitors on my blog every day. Maybe my blog would be more popular if I dyed my hair pink and blue. What do you think? I think I'll dye my hair green. I say go for it! It will keep your patients entertained. I'm still old school about that. The tried and true analog method of researching, writing, and completing a polished draft of a written work and then shopping it around still works wonders even in the digital age. Besides - you're an excellent, witty, writer with a fascinating background. The skies the limit, MJ.